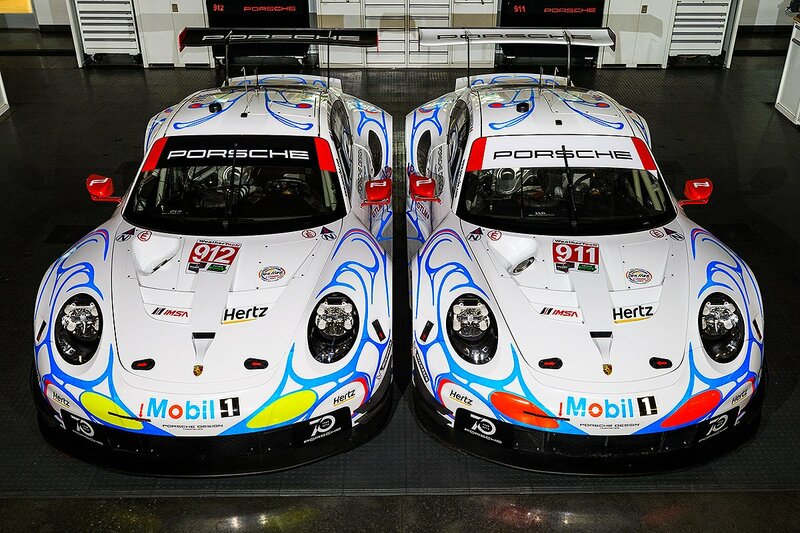 Porsche Motorsport North America finally understands that fans want to see something other than the staid and German red/white/black stripe livery that they have been running all year. I think Porsche got more press for running a Pink Pig and a Rothmans livery on two of their 911 RSRs at Le Mans this year than they did for actually winning the damn race! That theory is back again with a striking throwback visual to the 911 GT1 that dominated Le Mans in 1998 with its wild Mobil 1 livery. This is perhaps one of the least repeated liveries in Porsche's history, but it looks awfully good on the current mid-engine 911 RSR. Porsche will be running Patrick Pilet, Nick Tandy, and Frederic Makowiecki in the red-accented #911 car, while Earl Bamber, Laurens Vanthoor, and Mathieu Jaminet will be sharing the acid-green-accented #912 car. Earl Bamber is fresh off a weekend down under racing with Shane Van Gisbergen in the Red Bull Holden Racing Australia car during the Bathurst 1000k race. Porsche have not had an incredible year in IMSA this year, suffering from some pretty atrocious luck. The team have not won a race since the fourth round at Mid Ohio back in May. Here's hoping for some of that 1998 Le Mans magic for the guys at Petit this weekend. You can watch the full 10-hour race on Fox Sports networks.